When this farm girl arrived in the big city to attend college, the population of Barrie was around 45,000 people. I was excited to be living in an urban area for the first time in my life, eager to spread my wings, make new friends and have a bit of fun. 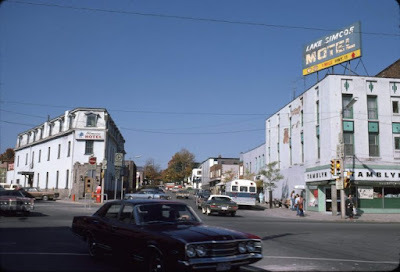 I was given bits of advice from those who had lived in Barrie longer than I but, of all the many pearls of wisdom given by locals of my age group, I only really remember one. Never be seen coming out of the Simcoe Hotel. I am not exactly sure why I was supposed to avoid this particular establishment as there were plenty of other taverns of a similar vintage in Downtown Barrie - the Wellington, American, Clarkson and the Clifton over on Bradford Street. They were all perhaps a little rough around the edges but very popular nonetheless. So why the Simcoe? That advice was given to me by a long forgotten person in late 1982, and in all the years since then, I have never been in. Until today, that is! If the Y.M.C.A. once proclaimed that Barrie is the wickedest town in the Dominion, how bad must the Simcoe Hotel have been earn the honour/dishonour of being the most unsavoury in Barrie? These are stories that I would really like to hear and I hope that some readers might share a few as I am very curious now. Why was this fabulously unique and historic flat iron building held, at least for a time, in such low regard? Oh please, do tell! The current iconic building that anchors Five Points today was built in 1877 by Michael Shanacy, to replace an 1850s era hotel that was destroyed by fire the previous year. I understand that the former structure, also known as the Simcoe Hotel, had a reputation for wild west style barroom brawls in the 1860s and 1870s. So in through the door that so many farmers, lumbermen and traders walked in and staggered out, I stepped into the front dining room to have some breakfast. Today, the sign above the south facing entrance says Bourbon, which is the latest (since 2013) eatery to be located within the walls of the Simcoe Hotel building. The rooms upstairs are still rental units, but the restaurant and bar area got a major face lift in 2007 when it became the (now gone) Flat Iron Grill. 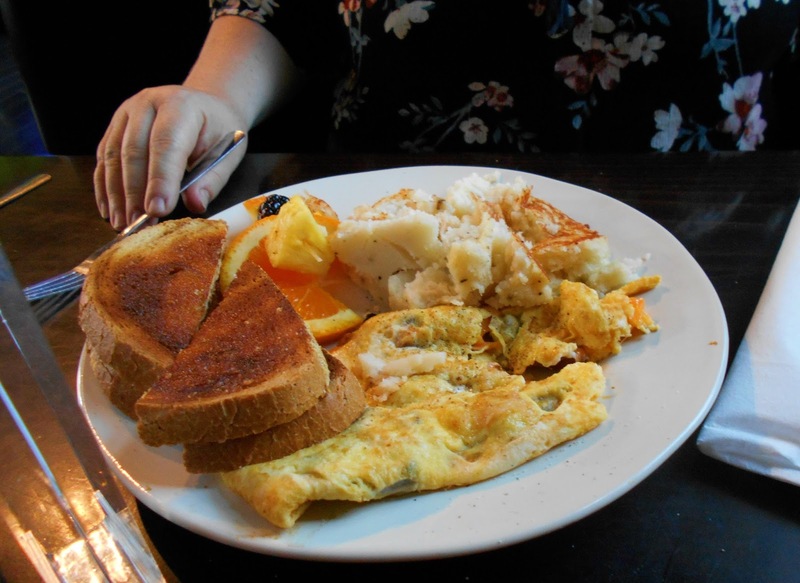 The Bourbon offers popular fare such as caesar salad, wings, poutine, nachos and burgers today, and on Saturday and Sunday mornings, breakfast. 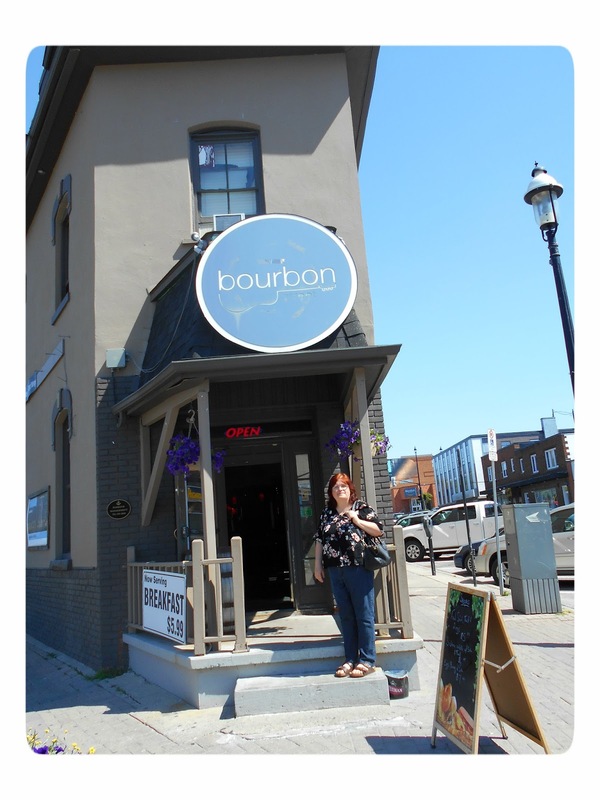 My husband, Ron, and I took a little tour through Downtown Barrie this Saturday morning and stopped in to old Governor Simcoe's namesake for a bite. I almost wish I had seen the before to appreciate the after, because what we found was a lovely little place, neat, clean, modern with a million dollar view of Kempenfelt Bay. On this sunny day, in this quiet eatery, I found it hard to imagine one hundred plus years of inebriated ruffians being tossed bodily out this very front door onto a dirt street. Darn. Our server was a delightful lady with a soft voice and gentle manner. She brought us some robust coffees and we awaited our breakfasts in a comfortable 10 year old booth while looking out 140 year old windows. The easterly view would have changed in 1994 when the Sam The Record Man store burned. The western view met the same fate with the loss of the Wellington Hotel in 2007. Somehow, the ol' Simcoe still stands strong. Mmmm breakfast! Ron got the classic bacon and egg breakfast and I got a fluffy cheese and mushroom omelette. The only thing wicked or sinful that I encountered at the Simcoe Hotel today were the Bourbon's fried mashed potatoes! Yum! This blog post was originally written by me for barriearchive.ca and published there on August 8, 2016. 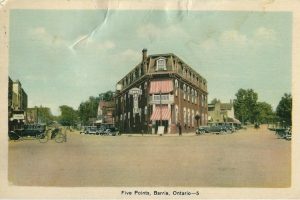 Please check out this wonderful free, searchable online museum of Barrie's photo, audio and video treasurers from the 1880s until today!